While I've kept plot details for the second season to a minimum, please be aware that there are some major spoilers for the show's first three seasons. 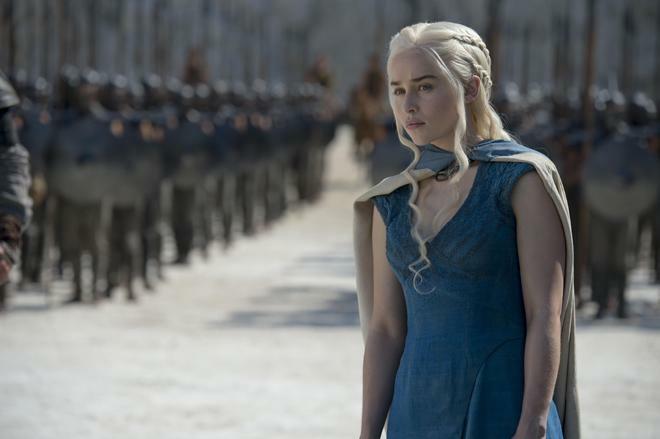 With its fourth season, 'Game of Thrones' continues to subvert narrative expectations, creating a world where the scales of good and evil perpetually swing, and both honor and cruelty are punished in equal measure -- but rarely how or when we want them to be. Epic in scope yet intimate in storytelling, the show excels at large-scale action and nuanced character moments, weaving a plot that grows more rich and textured with each passing year. Though this season's structure feels slightly jumbled and occasionally stagnant, the major beats and emotional payoffs are absolutely riveting and the groundwork has been laid for many future exciting twists and turns. 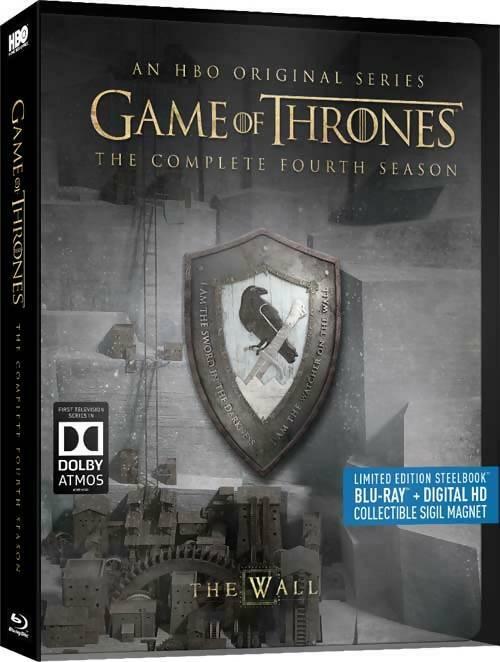 HBO presents 'Game of Thrones: The Complete Fourth Season' in a new limited edition Steelbook package. Four BD-50 discs are stacked (two on the left side, two on the right side) in a sturdy Steelbook case that comes housed inside a plastic shell. A plastic tray is also included that features a magnet of the Night's Watch sigil. Instructions for an UltraViolet/iTunes digital copy are included as well. After some warnings, logos and skippable trailers, the discs transition to standard menus. The packaging indicates the release is region A compatible. The picture here is essentially just as impressive as previous seasons with exceptional clarity and dimension. Fine textures are rendered in every varied location and intricately designed set and costume, bringing an unrivaled level of TV production design to the screen. Colors are also beautifully realized with varied palettes for each region, bringing warm reds, cool blues, and earthy tones to each corner of Westeros and beyond. Episode two's royal wedding and subsequent party scene are especially striking, with very rich colors and tiny details highlighted throughout the extravagant ceremony. Contrast is balanced well with bright whites that don't overpower the image and usually deep, inky blacks. With that said, some dark scenes do exhibit a slightly muddy quality. Likewise, while the show remains one of the most impressive series on Blu-ray, the encode leaves just a little to be desired with a few minor technical issues. Spikes in noise crop up here and there and banding/false contouring is visible in some instances. Dark and foggy sequences (like the scene where Sansa meets up with Littlefinger) prove to be especially troublesome, revealing some very slight but still noticeable compression artifacts. As with the previous Steelbook releases, HBO has upgraded the audio here, offering a new Dolby Atmos immersive soundtrack. And like those earlier Atmos discs, the results are quite spectacular. To evaluate the Atmos audio, Pioneer has been gracious enough to loan me a VSX-1131 7.2 Channel Receiver, a pair of SP-T22A-LR Add-on Atmos Speakers, and an SW-10 Subwoofer (full reviews for each coming soon!) to bolster my existing Pioneer SP-PK52FS 5.1 Home Theater Speaker Package into a 5.1.2 upfiring Atmos system. It should be noted, however, that the discs default to standard Dolby Digital 5.1 soundtracks upon startup, so Atmos and TrueHD users should make sure to switch the audio settings in the menu before watching any episodes. Since I've already covered the basics of the audio in my original review (for all intents and purposes the same strengths apply here), I'm going to focus exclusively on the Atmos-specific benefits of the new mix in this review. Just as with the concurrently releasing Season three discs, the Atmos mixes here improve upon the previous 5-star soundtracks in both subtle and more overt ways. It's not always a dramatic night and day upgrade, mind you, but the added height objects bring an extra plane of audio to the series, enhancing the show's general sense of atmosphere with ambiance and music cues that fall from above the listening area. Rustling wind, drifting snow, chirping crickets, fluttering crows, bellowing horns, and screeching dragons all make their way to the height speakers when appropriate, extending the show's varied landscapes in every direction. The battle between the Viper and the Mountain features some notable height objects as well, sending crowd reactions of delighted applause and horrified screams overhead. Of course, it's really episode nine, "The Watchers on the Wall," that proves to be the highlight of this disc. 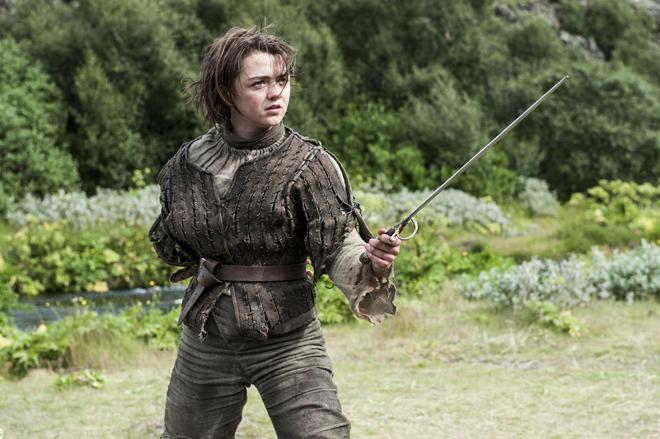 The majority of the runtime focuses on a thrilling battle as the Wildlings attack Castle Black, and the way arrows pierce through the air from above, moving overhead to the rears and vice versa, is quite impressive. Likewise, the episode's infamous scythe attack just might feature my favorite use of Atmos mixing in the season. As the massive blade extends from the wall we hear shards of ice break free and fall from above, and then we hear the sharp metal extend across climbing enemies in a loud burst of overhead chaos. I'm trying to be as eloquent as I can in my description, but it's simply badass -- and in ways that a traditional surround sound mix just can't be. Taking the show's already impressive surround sound mix to another level, the Atmos audio provides an often delicate but effective upgrade. Audiences likely won't be able to pinpoint overhead effects in every scene, but height objects are employed in both subtle and aggressive ways when called for, leading to a natural and intricately layered immersive audio experience. Beyond the obvious benefits of these new mixes, it should also be noted that the Atmos tracks will play as Dolby TrueHD 7.1 for users who don't have Atmos systems. This means that 7.1 users will still get an upgrade over the 5.1 tracks found on the previous release, even if they don't have Atmos yet. 'Game of Thrones: The Complete Fourth Season' offers another masterful collection of episodes from the increasingly popular and epic series. There are some slight pacing and structural issues, but this continues to be one of the very best shows on TV. This new Steelbook package offers the same great video and supplements from the last release, and adds a great new Dolby Atmos audio presentation -- improving upon an already exceptional mix. With that said, since there really isn't any new content here, it makes the bottom line recommendation a little tricky. For Atmos users (or those who plan to upgrade) who don't already have the show, this is an absolute must own set. Likewise, depending on how big of an audiophile you fancy yourself, even Atmos users who already own the previous Blu-ray might want to consider upgrading to this release. If, however, you already own the series and don't have (or plan to ever have) Atmos, then this set will really only appeal to diehard Steelbook collectors. But any way you look at it, this is now the best Blu-ray version of one of the best shows on TV.